We spent our last day on the boat relaxing. I made it to the early morning Tai Chi, then drank coffee on deck and sketched the Shi Bao Zhai pagoda while the others visited it. Sailing on to the Ghost City, we avoided another tour and watched one of the Bavarian group flying his drone. This made the ship’s security officer quite nervous, especially when it disappeared over the hill. “Made in China,” commented the owner, as he packed it away. 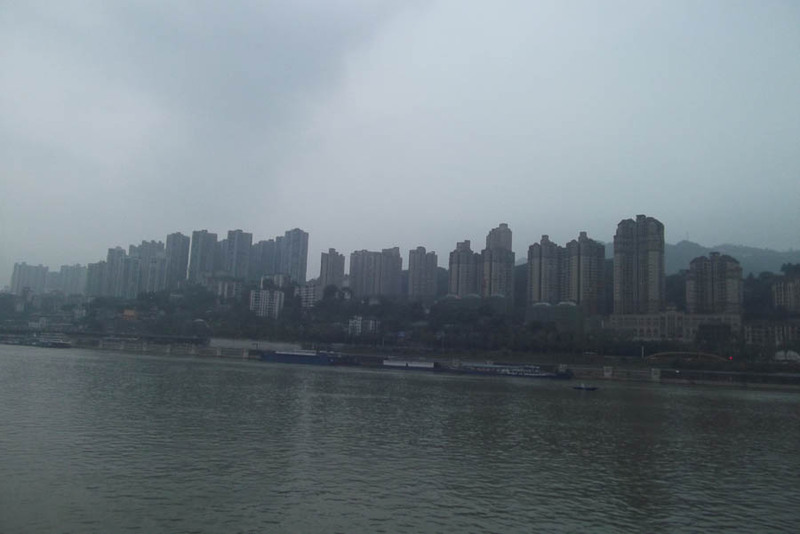 After a peaceful journey through pitch dark empty valleys, we awoke the next morning to the New York style skyline of Chongqing. It was all high rise blocks and suspension bridges here! We had to be ready with our luggage at 7 am, flasks full and lunch foraged. 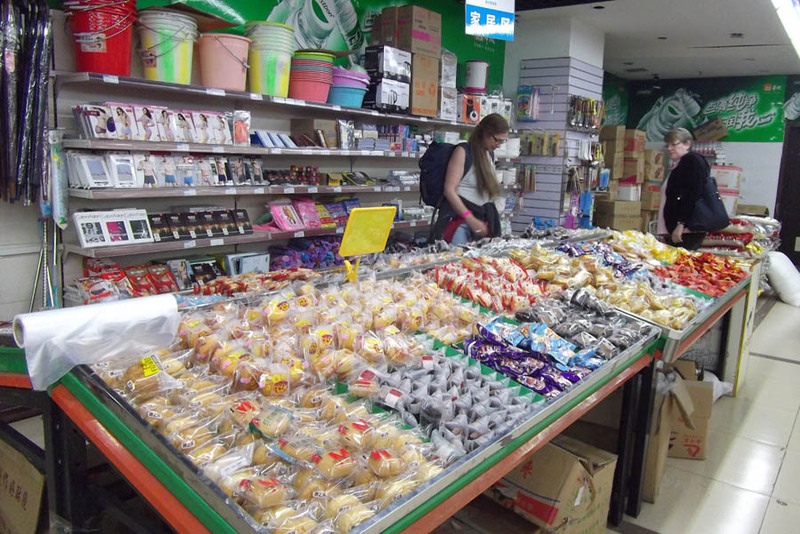 There was the chance to buy more food, if you could decipher the labels in the supermarket where we paused to provision ourselves for a day’s sightseeing. The dried beans flavoured with star anise were interesting, but the spicy snake wasn’t so popular! 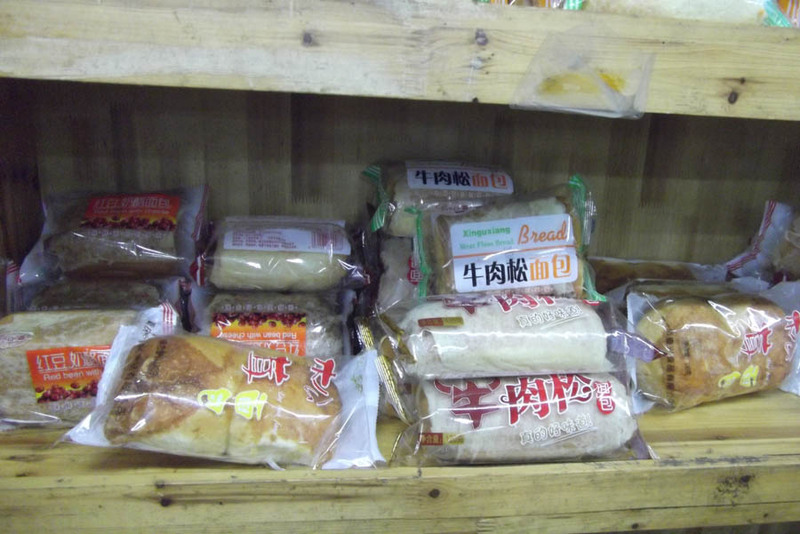 Meat floss bread – more ambushes for the vegetarians! 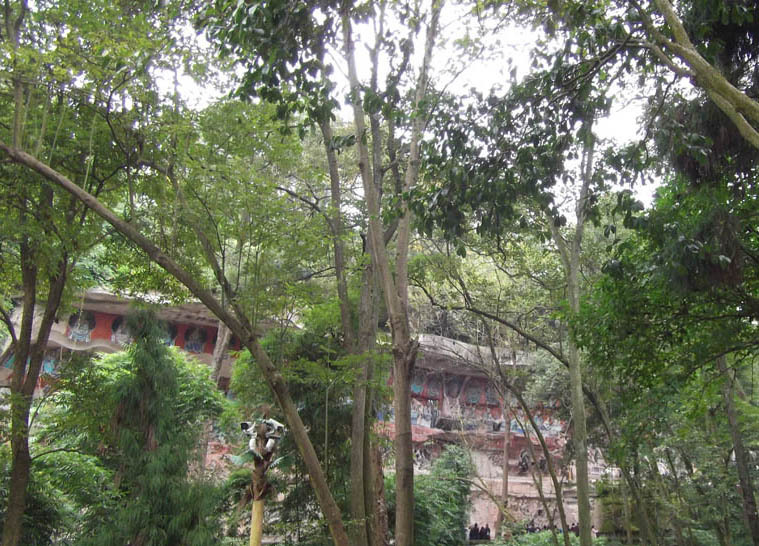 Chongqing is a steep mountain city, so cycles are rare. Bus and land rails supplement private car use. 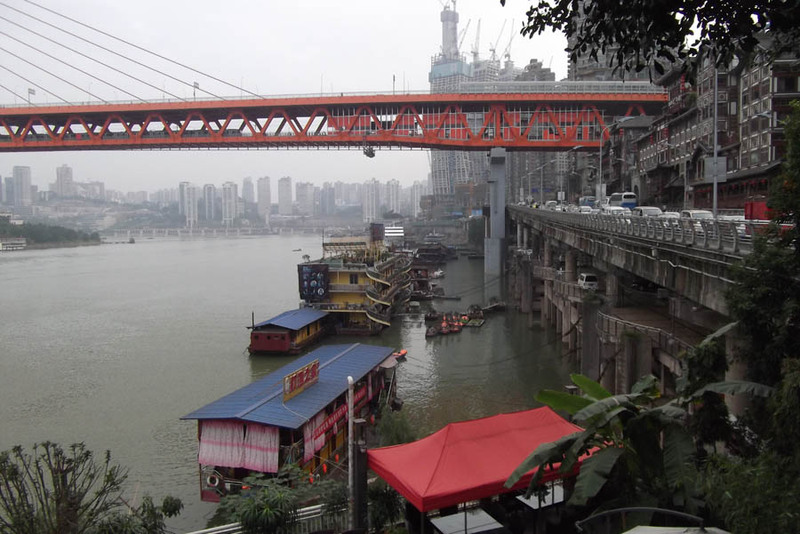 A few large houseboats were moored in the river; this megacity is at a key confluence. As we drove, we learned about housing and the cost of living. The high rise flats are sold by floor space in square metres, rather than the number of rooms. There’s no fittings when you buy a new build flat. It’s only a concrete shell with one tap, one electrical point and the standard underfloor heating. You add everything yourself. Ikea is big in China. 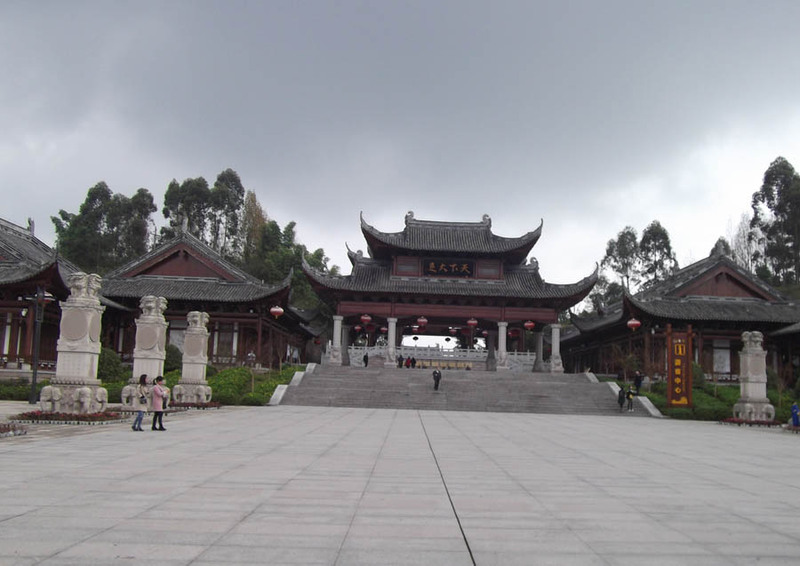 The Dazu carvings were right at the end of a huge modern complex comprising various courtyards and steps; it was quite a walk. Luckily the weather was still dry and warm. We crossed the Bridge of Separation, festooned with padlocks and ribbons. Red was for fortune and yellow for health. The path wound on through a pleasant forest until we came out at the central cliff face. These huge, intricate murals were cut between 1170 and 1252 CE, at which point a Mongol invasion scattered the community. The carvings were gradually concealed in the jungle, and only recently rediscovered. 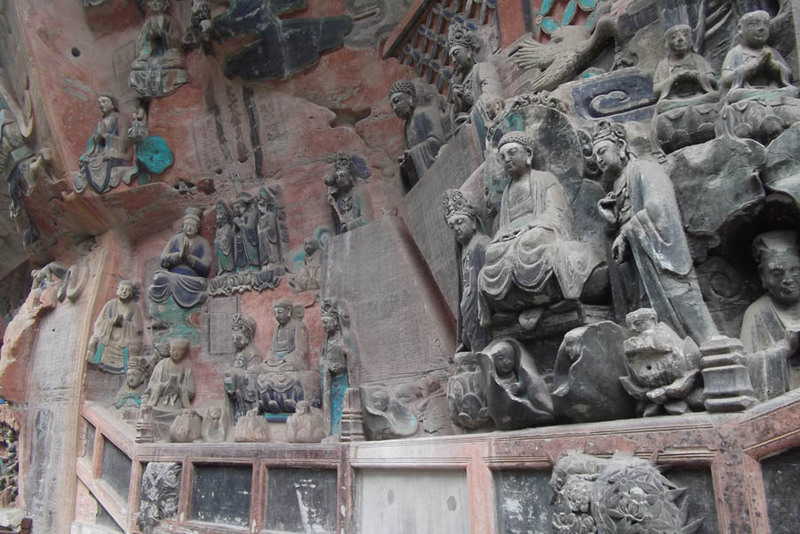 The murals show various aspects of Buddhism. Heaven and Hell are pictured, with a disturbing emphasis on demonic torture. Rather extreme examples of filial piety and parental love are also depicted. 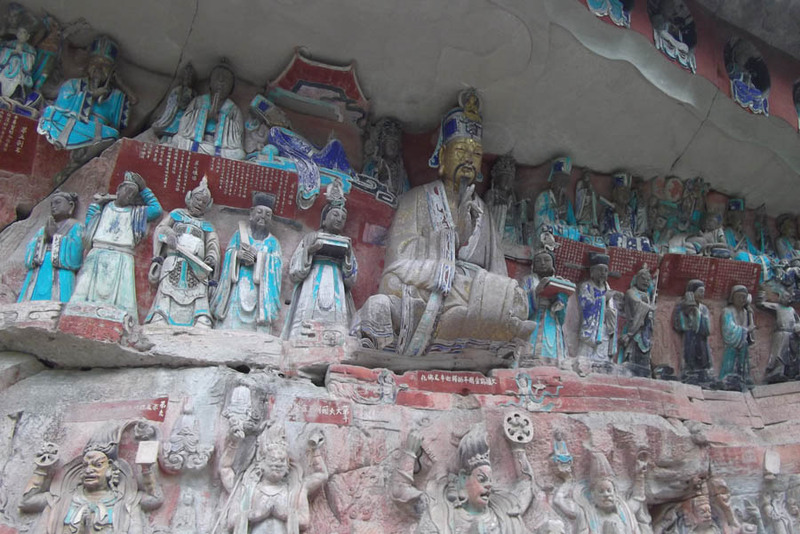 The figures aren’t statues dragged into place, but a three-dimensional mural cut into the rock face itself. It’s quite a feat of engineering for the time! 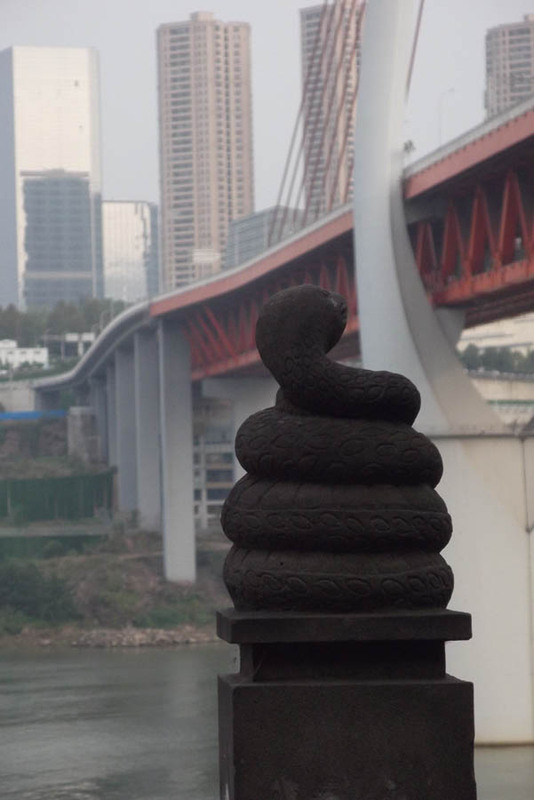 Our flight to Xi’an was delayed the next day, so we had time to look around Chongqing. They’re fond of sculptures here; we saw some very evocative bronzes. 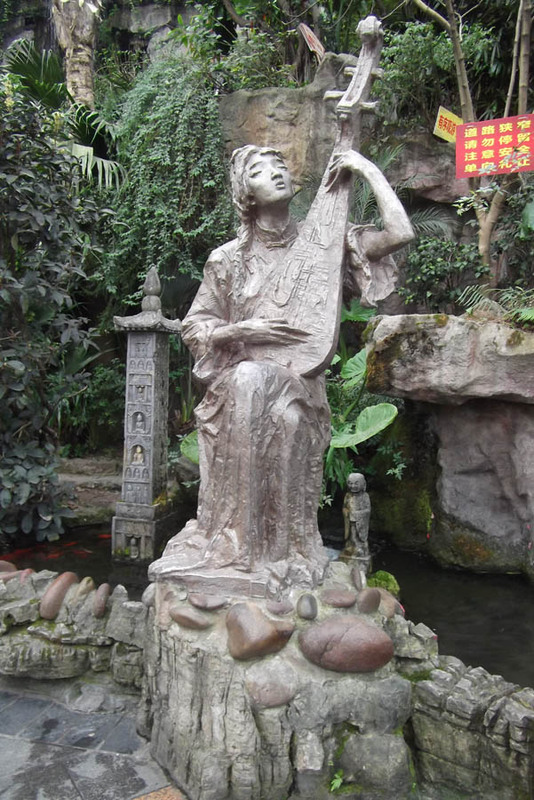 The time teller, portrayed above, walked the midnight streets of old China, and always knew the best ghost stories! 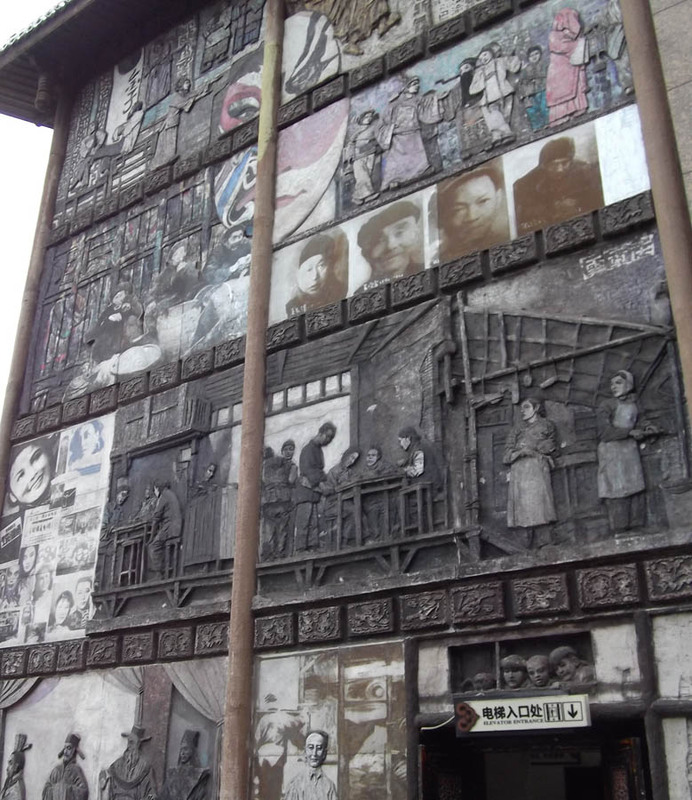 There was an opera house, fronted by a collaged mural. Informal mosaics of broken pottery were a feature in this area; they were said to bring good luck. 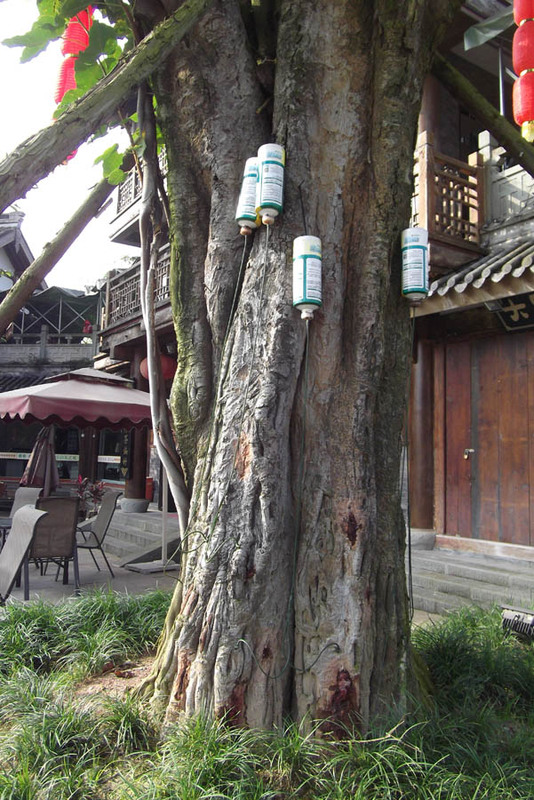 The banyan tree is the emblem of Chongqing; we have no idea why this one was being drip fed. It was one of the many mysteries we encountered. The guide rounded us up and we were off to Chongqing airport, where we lost our water and lighters again in the security check. A couple of sinners in the party had accidentally left lithium batteries in their hold luggage, which had gone on ahead of us; our group was called over to the naughty desk! A couple of hours flying, and we were in Xi’an, the ancient capital city. We occupied ourselves during the flight by reading the sign on the back of the seat. We’d finally worked out how to use the Chinese-English dictionary to look up words, and were very pleased with ourselves! It only took us a couple of hours to read six characters! If I’m visiting a country where I don’t understand the alphabet, a small dictionary can be helpful, like a paper version of Google Translate. It covers the areas that phrase books don’t reach, such as ‘orthopaedic surgeon’, though it only works in countries where most people can read their own language. 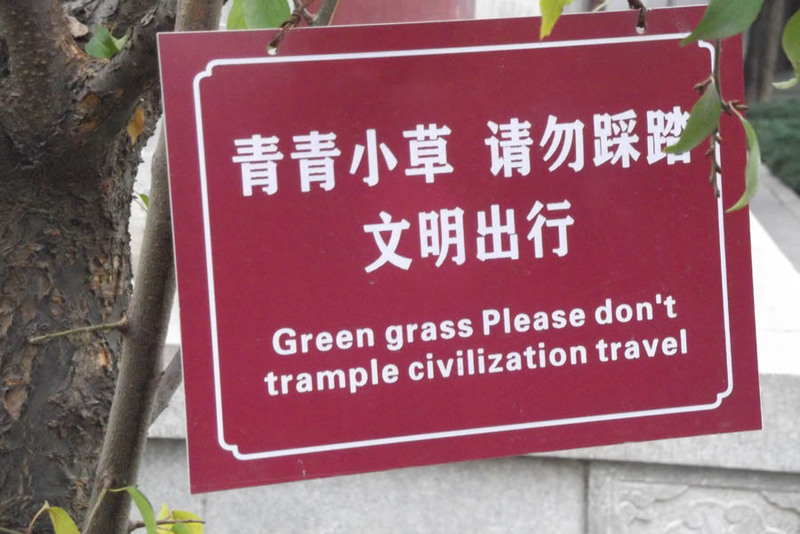 It seems to me that reading Chinese is more like understanding a picture than reading a sentence. The meaning of each character is influenced by the ones surrounding it, which is why translation programmes struggle.